If your home has a room that looks boring and that needs some quick brightening-up, you may want to consider hanging a linear electric fireplace as the one shown in the picture. These fireplaces can be directly mounted on the wall or recessed into the wall when the heating element and the control panel are on the front of the unit. Linear electric fireplaces come in many shapes, styles and types. Some are used just for decoration, to fill up an old wood fireplace recess that is no more operational, or to simply brighten up a dull room. Traditionally, only few of them have been installed for the precise purpose of heat generation, mainly because wood and gas fireplaces have been shown to be cheaper and more efficient for heating the home. Also, in the past, most electric fireplaces lacked elegant style and came with tacky and cheap looking artificial logs that would shine or sparkle when the unit was plugged. Nowadays, you can get electric fireplaces that are not only very stylish looking with realistic looking flames, but that can also be used for heating the room in which they are installed without costing a lot in electricity bills. In warmer days, when no heating is required, you can simply turn on the flames display without turning on the heat and still enjoy the beautiful ambiance created. On cooler days, if heating is required, you can turn on the heat as well. These units usually come with a remote-control device that can be used to turn on/off the unit and adjust the heat generation as well as the LED flames display. ​​The following table compares the various features that come with these fireplaces. ​Please read the explanations to the table notes that follow for a better understanding of the features. Touchstone Onyx has its control panel on the side of the unit. Therefore, if the unit is recessed into the wall, it can not be accessed. In that case only the remote-control can be used. ​Touchstone Sideline has its control panel in front of the unit, under the vent. Napoleon Allure has a touch display panel in front of the unit. Note that the on-screen controls dim after 10 seconds, disappearing completely off screen. Touchstone Onyx was designed to be mounted on the wall like flat-panel TV. Because it has the heat vent on top of the unit, it should not be recessed into the wall unless you are planning to use the unit with the heat turned off. But, even then, because the control buttons are on the side of the unit, you will not be able to access them if the unit is recessed into the wall. The preferred way of mounting this unit is on the surface of the wall like a TV, and not recessed into the wall. Touchstone Sideline fireplace is designed to be recessed into the wall. The control buttons and heat element are all in front of the frame. 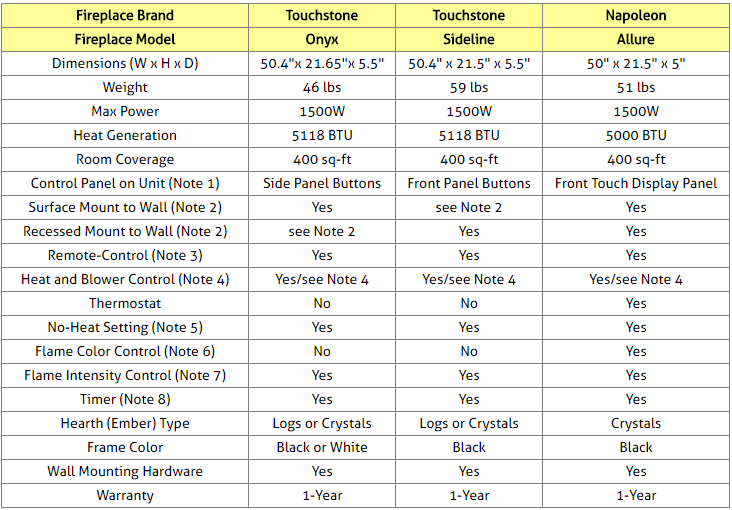 If surface mount is desired, Touchstone Onyx should be selected. Note that, when mounting these fireplaces under a wall-mounted flat-panel TV, they should be placed at least 12 inches below the bottom of the TV. Napoleon Allure has its control panel and heating element in front of the unit. It can be mounted on the surface of the wall like a TV, or it can be recessed into the wall for a flush mount. All fireplaces considered here come with a remote-control device that allows invocation of all controls that can be invoked from the control panel on the units. Both Touchstone fireplaces can be set to high heat, low heat or no heat: When the heat control button is pressed, the fan blows cool air for 10 seconds, and then starts blowing warm air as it is in the low heat mode (750W). When the button is pressed for a second time, the unit starts blowing hot air and goes into the high heat mode (1500W). Finally, if the button is pressed again, the heater turn off, the fan blows cool air and then turns off. Note that there is no Thermostat and no temperature selection. - No heater or blower. - Heater blows warm air (750W). - Heater blows hot air (1500W). The no-heat setting of all the fireplaces considered here operates the unit without heat, for flame effect only. 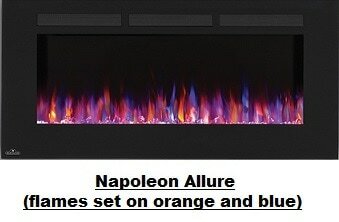 Napoleon Allure allows changing the color of the flame: either orange, blue or both colors. Both Touchstone fireplaces have 2 flame intensity buttons on the remote. One is used to increase gradually the brightness and the other to decrease gradually, until the desired brightness level is reached. 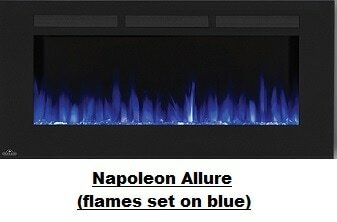 Napoleon Allure allows controlling the intensity of both the blue and orange flames. You could have the orange flame at zero and the blue flame at maximum intensity, or vice versa, the blue flame at zero and the orange flame at maximum intensity. Or you could have a combination of both flame types with any desired intensity. Both Touchstone fireplaces are equipped with a timer that allows shut off in 30 minutes to 7.5 hours. Napoleon Allure is also equipped with a timer. It has 9 Settings: (0.5h, 1h, 2h, 3h, 4h, 5h, 6h, 7h, 8h). For exact price information on the Touchstone and Napoleon fireplaces considered here, please refer to the Amazon products section below. Note that sometimes Amazon provides a discount on the List Price of sold products. If a discount exists, both the List Price and the actual Amazon Price will be shown when you click the Amazon product link images below. ​So which of the electric fireplaces is best for you? ​The linear electric fireplaces considered here are excellent products as shown by the good reviews and excellent average rating each had received from Amazon customers at the time this article was written. Indeed, they had each received an average rating of 4.5 stars (out of 5 stars)! Therefore, there is a good chance that you would be quite happy with any of these fireplaces. If you need a wall mounted or wall recessed electric fireplace for just displaying the beauty of the flames and not for heating the room, then any of these fireplaces can be selected. Note that they all have a no-heat option. ​- Touchstone Onyx should be recessed into the wall only if the no-heat option will be used, as it has its heating element on top of the unit (not in front!). Note also that when Touchstone Onyx is recessed, you will not be able to access the control panel which is on the side of the unit, and you will need to use the remote-control device to control the fireplace. ​- If you need the fireplace to be mounted on the surface of the wall, you can use any of the fireplaces listed above, whether you choose to use the unit for heating or not. Only Napoleon Allure is equipped with a thermostat and allows you to set a desired temperature. The other fireplaces considered here have only high heat, low heat and no-heat options. 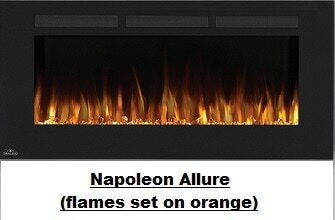 Only Napoleon Allure allows modifying the color of the flames: orange, blue or both colors. Napoleon Allure comes only with crystal ember, while the Touchstone fireplaces come with both logs and crystals so you can choose the ember type depending on the mood you want to create. ​Clearly, Napoleon Allure is more expensive than the other fireplaces considered here. But, the additional features, such as the thermostat, the ability to use it in both recessed and surface mount modes without having to turn off the heating, the touch display panel in front of the unit, and the variable ember colors justify the higher price. When you get the Touchstone Onyx and Touchstone Sideline fireplaces shown below, both faux-logs and crystals are included in the purchase, so you can use the type of ember you prefer. Napoleon Allure comes with a crystal ember. ​Note also that when you click the Amazon product links below, you will be getting a choice of additional fireplace sizes whenever other sizes are available.